This year’s show, on 9 December, also took peace as its theme, bringing a positive note to the end of a tough year for Kenya, both politically and financially. 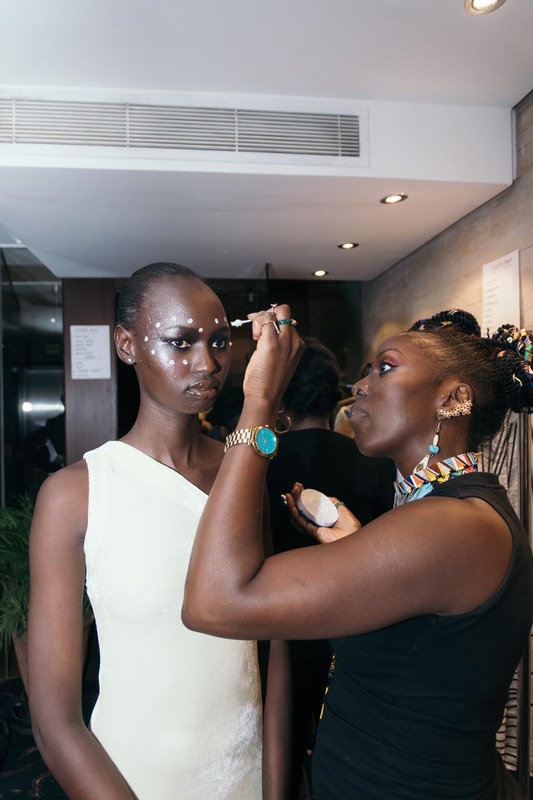 The catwalk was surrounded with 5,000 origami doves that cascaded from the hotel’s high ceilings, setting a beautiful scene for an evening of stylish entertainment hosted by Sauti Sol's Willis Austin Chimano and stylist Annabel Onyango. Dolat is a key figure at the Nest Collective, the group of thinkers and doers who play a pivotal role in stirring dialogue among Kenya’s creative community with its multidisciplinary output across the visual arts, and financial support of regional artist with its seed funding enterprise, Heva Fund. 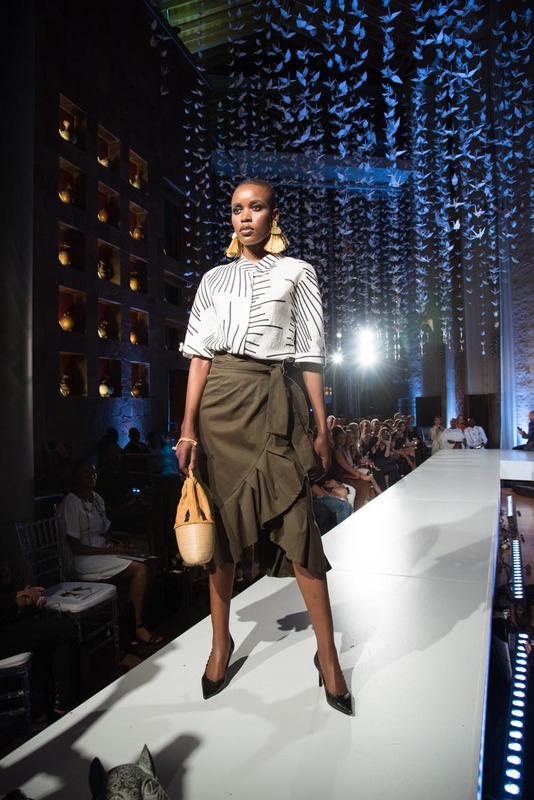 For Tribal Chic, they and Tribe Hotel invited Rwanda's CollectiveRW to participate in the show plus host a pop-up shop. 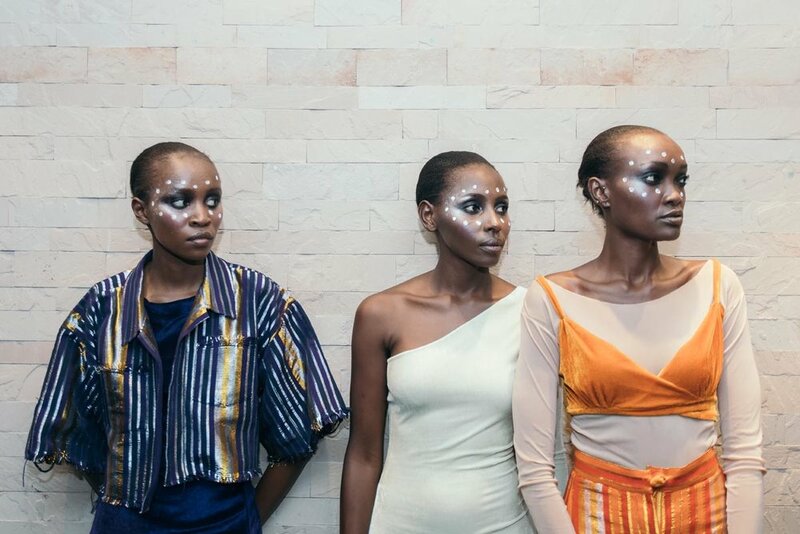 Among this key group of Kigali-based designers is Linda Mukangoga of Haute Baso, who opened the show. 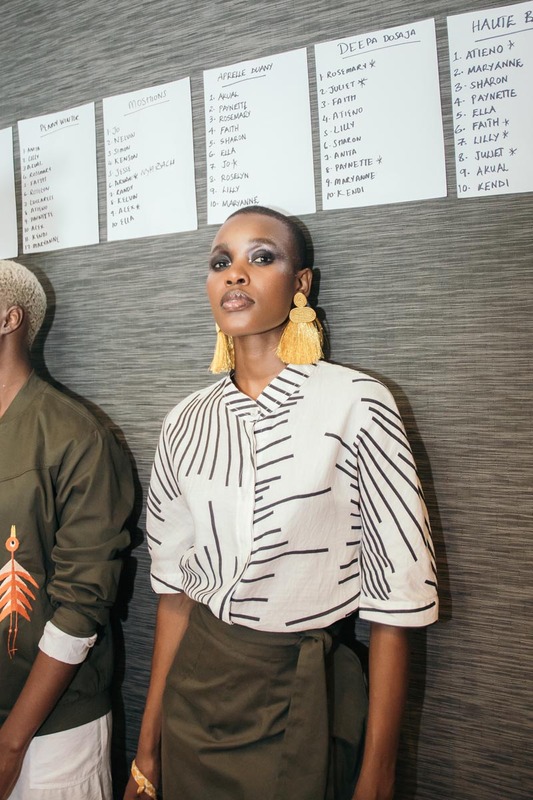 Rwandan menswear brand Moshions presented the Intsinzi II collection, exploring “the beating drums, triumphant shouts and joyful faces of victory”. These understated warriors took to the catwalk wearing t-shirts, tunics and drawstring pants in shades of burnt red, black and navy, which were completed with intricate monochrome beading on collars and cuffs. Paint splattered bombers and shorts introduced a risky edge, as did canary yellow pleated half skirts and black floral head-to-toe looks. Nairobi stalwart Deepa Disaja offered up her diffusion line comprising silky, feminine silhouettes in white, black and warm orchard shades featuring hand painted flowers and leaf embroideries. Newcomer Lilabare by Ria Ana, took a cool, casual approach. Her easy, breezy pieces in sustainable cotton, jersey and linen included sundresses, t-shirt dresses and wrap skirts that wafted enticingly as models walked. All looks were worn with printed canvas ‘afrodrilles’ by likeminded ethical shoe brand Ubuntu Made. Conversely Qaal by Somali American designer Nico Adam showed what’s possible with contemporary modest fashion. Long black and white gowns were spiced up with wax print belts, kanga headwraps and sparkly buttons. Kenyan accessory designers were also very well represented. Aprelle Duany’s coastal life-conjured bags in sea blue, grass green, coral and sand included tasselled shoppers, woven clutches and large, sturdy weekenders. Penny Winter’s luxe, grown-up jewellery pieces ranged from waist beads and tropical motif necklaces to chunky Perspex cuffs, leather chokers and gold chains encrusted in gemstones. And similarly established designer, Niku Channa, pulled out all the stops with his succession of nearly naked male models wearing huge pieces such as wooden mask arm bands, aluminium chainmail necklaces and golden beaded globes that danced across the body. Providing the finale for Tribal Chic was I.Am.Isigo by Nigerian designer Bubu Ogisi. The rising star showed her SS18 collection, Mino, inspired by the Dahomey Amazons – a fearless female army dating back to the 16th century who protected what is now the Republic of Benin from invaders. “With every collection I’m trying to explore different traditions across Africa,” Ogisi says. “What appeals to me about the Mino is the strength of their androgynous nature and ruthless attitude. It’s a striking story that can help us all feel more empowered and confident.” She translated these ideas into special cloths woven in Ouidah, Benin in regal shades of amber, ivory, tan and indigo, and styled into grand kaftans or figure-hugging skirts and trousers. These complimented slinky, asymmetric tops and dresses in crushed velvet or were layered over neutral mesh pieces.